HICKORY, North Carolina (WTVD) -- At least eight fire departments from three different counties were called to the site of a church fire near Hickory, North Carolina early Monday, according to WSOC. 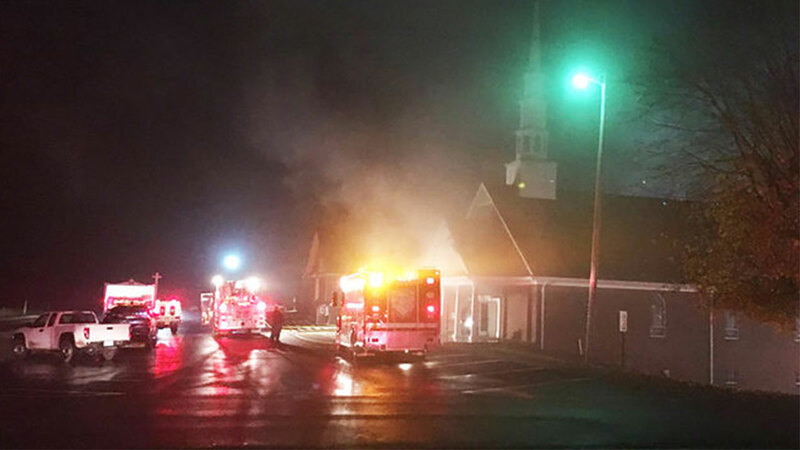 At about 2 a.m. firefighters were called to the Providence Baptist Church and found the church engulfed in flames and smoke. WSOC reported that officials found the words "anti-gay hate group" spray painted on a wall behind the church. In 2012, Channel 9 reported that someone left suspicious white powder at a church in Maiden, North Carolina after a sermon where the pastor suggested gay people be locked behind electric fences and be left to die. Pastor Ernest said the church changed its phone number because people confused Providence Baptist Church with Providence Road Baptist Church in Maiden. Investigators believe that the fire started in the boiler room located in the basement. Most of the damage found was in the back where Sunday school is taught. "Our prayers are for them because we love people," said pastor Ernest Richards. "With our love for them, regardless of what they've done, we're still going to have that compassion for people. "